Jaisamand Lake, also known as Dhebar was built by Maharana Jai Singh in 1685 while building a dam on the Gomti River. This was built for the purpose of accessing the waters of River Ruparel. The Jaisamand Lake is now the second largest artificial lake in Asia after the Aswan Lake in Egypt. After visiting the lake you will get an idea of how religious the Rajasthani kings were. There are a number of temples around this lake, all built during the 17th century. The most attractive feature of Jaisamand Lake is its extensive area. The lush green surroundings of the place during the monsoons are simply a visual treat. The summer palace of the Udaipur Queens which makes the perfect background. The six cenotaphs with stunning marble carvings. The beautiful palace with a courtyard, situated on the northern side of the lake. From the courtyard here you can get the best view of the sparkling waters of the lake. The 12 pavilions lined on the banks all made of red sandstone and marble. All these are based on lovely lotus motifs made of marble. The island in the middle of the lake which is said to have served the guests of the Royal Families during parties and celebrations. The seven islands that surround the lake. One of it is still inhabited by the Bhil Minas tribe. Out of all the biggest is known as ‘Babaka Bhagra’ and the second largest is known as ‘Piari’. There are marble steps to go down to the waters from all these islands. The beautiful Shiva temple located within the lake. The sanctuary attached to lake houses cute little migratory birds and also the beasts like Tigers, Leopards, Panthers, Wild Boars and Crocodiles. 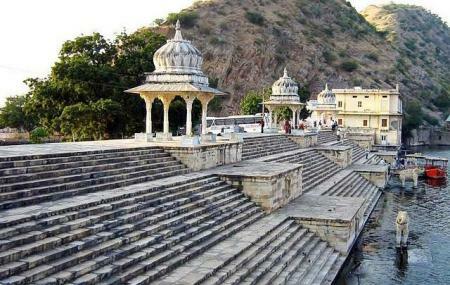 This is made on the place which is said to have been the hunting grounds of the Mewar Kings. There is also a game sanctuary, which has equipments for many water sports. You can also enjoy paddling and boating while you admire the, serenity and beauty of the place. This place is a very popular picnic spot. Adding to its beauty is the recently built ‘Sunset Point’, which lets you take a picture perfect view of the sun. Boating charges and water sports charges are extra. Please check the timings before you visit. The lake is well connected with the main city by buses and taxis. Recommended time to visit: Before dusk. The nearest airport is Delhi IGI. How popular is Jaisamand Lake? People normally club together Garbhaji Falls and Late Night Shopping In Alwar while planning their visit to Jaisamand Lake. The sceinic view is nice but the place needs some management. The road are rough and even not a cemented road is available. Although it is a nice and calm place. You can visit here in rainy days to experience the nature's calm.